The joining hands by fugitive Gorkha leader Bimal Gurung with arch-rival Mann Ghising of the Gorkha National Liberation Front (GNLF) to back a BJP candidate for the Darjeeling Lok Sabha seat, has kicked up a political storm in the politically-restive Darjeeling hills in north Bengal. Analysts say the coming together of the two opponents in the hill political spectrum — both the Gorkha Janmukti Morcha (GJM) and the GNLF have ruled the hills in turns following violent movements for a separate state of Gorkhaland since the mid-1980s to until mid-2017, when Gurung held the reins of the GJM — symbolises “politics of staying relevance”. Raising the bogey of Gorkhaland periodically, hill parties have tried to stay relevant in the hill politics, they say. In a video clip uploaded on social media on Thursday from an “undisclosed” location, the fugitive Gorkha leader justified the coming together of the two rival parties and exhorted people living in Darjeeling hills to support the BJP to fulfill the dream of a separate state of Gorkhaland. Gurung and a section of the faction’s top-rung leaders have been “underground” since the 105-day-long shutdown in the hills in mid-2017 that saw the Binay Tamang faction taking over the reins of the party and the control of the Gorkhaland Territorial Administration (GTA) and subsequently aligning with the Trinamool Congress. 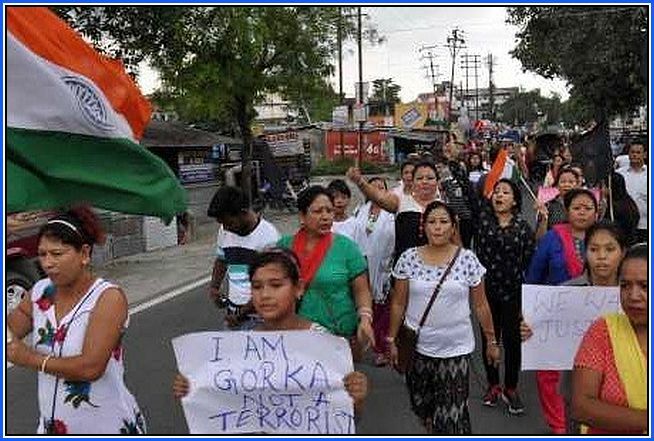 The Gorkha strongman has been on the run ever since a plethora of criminal cases was slapped against him by the Mamata Banerjee government in Bengal. “Since then, the former GJM boss has been trying to stay relevant in hill politics by periodically issuing statements on social media and releasing videos clips from ‘undisclosed’ locations, to allay fears of him being forced into political wilderness and to keep what is left of his support base, intact,” a Darjeeling-based analyst told Outlook. Gurung, in the video clip, justified the alliance with the GNLF and the BJP, saying it reflects the “genuine aspirations” of the hill people. Without naming Tamang and his deputy Anit Thapa, Gurung in the video clip says people should not forget the “martyrs” of the 2017 agitation and not forgive the two “gaddaars” (traitors) who have betrayed the Gorkhas by joining hands with the Trinamool. Leaders of the Gurung faction of the GJM say the party decided to back the BJP candidate for the Darjeeling seat as its alliance dates back to 2009. “It is shameful and sad to see GNLF has joined hands with the same people who hounded their founder out of the hills. The same people did not allow his wife’s body to be brought to the hills,” says Tamang on the alliance. The GNLF founder-chairman late Subhash Ghising was hounded from the hills by the GJM headed by Gurung, who was emerging as an alternative leader in the hills to his mentor-turned foe, in 2008. Gurung went on to spearhead two violent agitations in quick succession over the next decade, and emerged as the “undisputed” Gorkha leader in Darjeeling hills. The new alliance stands for a “greater cause” for the Gorkhas and the other communities of Darjeeling, Terai and Dooars, say Gurung faction leaders. The demand for separate statehood for Nepali-speaking people of Indian origin is more than 110-years old. However, no political party or leader has been sincere in resolving the century-old demand. “Once they assumed political control in the hills, ‘tasted’ the fruits of power, they conveniently forgot their constituents,” a political analyst who did not wish to be named told Outlook. “Time and again, the demand for a Gorkha identity and a separate state of their own got buried in the quagmire of ‘make-a-quick-buck’ power politics,” he added. The demand for Gorkhaland may be divisive depending on which side of the divide you are on. Those against, argue that Bengal cannot be further divided, but Nepali-speaking Gorkhas and other communities living in the hills for generations want a separate state of their own, saying they suffer alienation and apathy from those in power, and it is a justified demand. “But by continuing to debate the pros and cons of the demand, the two sides will just allow the Darjeeling stalemate to drag on,” the analyst says. The new political alignment will bring the BJP back into the political landscape of the hills. The BJP, desperate to gain a foothold in Bengal, is no newcomer to the hills. It rode piggyback on the GJM to win two successive polls in 2009 and 2014. However, the BJP has been in the political doldrums in the hills ever since Gurung has been on the run. Gurung as the GJM supremo in 2007 signed a tripartite agreement with the Centre and Bengal government that led to the formation of the Gorkhaland Territorial Administration (GTA) replacing the earlier GNLF-headed Darjeeling Gorkha Hill Council (DGHC), which too was a result of a tripartite agreement inked by Ghising with the then Congress-led UPA government at the Centre and the state government headed by veteran Marxist chief minister Jyoti Basu. But, despite the renewed support, the BJP may not have a free run for the Darjeeling seat like in the earlier occasions --- the BJP is yet to announce the party’s candidate from the Darjeeling Lok Sabha seat ---with the Binay Tamang faction of the GJM at the helm of affairs and has the sanction of the ruling Trinamool in the state, the analyst says. Mamata Banerjee has secured the Tamang faction’s support by fielding former Darjeeling legislator Amar Singh Rai as the Trinamool candidate for the Darjeeling Lok Sabha seat. Gurung has moved the apex court against his arrest, a plea that was dismissed. Gurung, Bengal intelligence agencies believe, keeps changing his location, moving between hideouts in eastern Nepal, Dehradun and the national capital, to evade arrest. The fugitive Gorkha leader’s supporters are hopeful of Gurung’s resurgence once legal wrangles are sorted out. Many in the GJM rank and file — aligned with Gurung -- believe that if the fugitive leader resurfaces, the tide in the hills can change overnight. Twenty-eight days is a long time in politics. Darjeeling goes to polls on April 18.